and barrel-rolling manatee who had called Southwest Florida home since 1949.
months old and was declared the official mascot of Manatee County in 1979.
with us for so long. Snooty’s legacy will continue at The Bishop Museum of Science and Nature (formerly known as the South Florida Museum) through our work in the Manatee Rescue and Rehabilitation Partnership, a network of providers who rescue sick and injured manatees, rehabilitate them and return them to the wild. We will also continue Snooty’s work as an ambassador for his species through our continued public education programs about the plight these endangered animals face in the wild and how we can work to secure a better future for them all. Snooty became an icon and an inspiration during his long life. Loved by millions, he played an important role in manatee conservation by inspiring people to care about, and to take action for his species. Here are highlights of his amazing life, for which we are all grateful. Thank you, Snooty! July 21, 1948 “Baby” (later to be referred to as Snooty) is born on The Prins Valdemar, a Danish warship that capsized in the Miami harbor in 1926 and later became a floating restaurant and the Miami Aquarium and Tackle Company. 1949 “Baby Snoots” comes to Bradenton for the Desoto Celebration and later makes his permanent home in an exhibit inside the South Florida Museum’s area in the Chamber of Commerce building on the city’s Memorial Pier. 1966 Snooty moves to the newly constructed South Florida Museum, at its current location. 1979 Manatee County Commissioners declare Snooty to be the County’s official mascot. 1982 Snooty gains even wider fame when the children’s television show, Captain Kangaroo, films him as part of a documentary on manatees. 1985 A hydrophone placed in Snooty’s tank reveals for the first time the high-pitched squeaks — Snooty’s vocalization. 1987 Snooty begins training to aid researchers trying to determine how well manatees hear at different frequencies. 1993 Snooty moves into his newest home: a 60,000-gallon exhibit in the newly constructed Parker Manatee Habitat. 1998 The Parker Manatee Habitat joins the Manatee Rescue and Rehabilitation Network and is introduced to his first companion, Newton. During his life, Snooty hosted 33 rehabilitating manatees. 2008 Snooty celebrates his 60th birthday at his annual Birthday Bash and Wildlife Festival. His life history makes him one of the most renowned ambassadors for endangered species and the environment. 2013 More than 6,000 guests visit the South Florida Museum to celebrate Snooty’s historic 65 th birthday — the largest crowd the museum has ever seen and a testament to Snooty’s popularity in the community and beyond. 2015 Snooty is officially certified as the world’s oldest captive manatee by Guinness World Records. July 23, 2017 Snooty passes away just days after his 69th birthday. It was with such sadness that I heard about Snooty’s accidental death this morning. Like so many others I remember visiting Snooty over 50 years ago as a small boy and being awed by this gentle and remarkable animal. Myself, like everyone who visited Snooty, felt a very special and personal connection with him. Snooty was much bigger than himself; he made a lasting impression and taught thousands of people about the gentle and unusual habits of manatees. He truly was one of Florida’s most famous residents. Snooty was his brethren’s goodwill ambassador and played an important role that has contributed to the protection of Florida’s iconic manatees. Our deepest condolences go out to all the At The Bishop staff who loved and cared for him and to Snooty’s friends from around the world. The staff, board, and volunteers of Realize Bradenton share in the sadness of the news that Bradenton’s beloved mascot Snooty has died. He was our community’s good will ambassador. We send our love to the staff, board, and volunteers of the At The Bishop who took great care of Snooty for many decades. I remember the first time I met Snooty. I was astonished when he rose out of the water, smoothly powering up on strong flippers, rested on the side of his pool and looked straight at me. Instantly my muscles took over, bringing me from my standing feet down to my knees, the fastest route to reach him. He wanted attention, my attention, and I couldn’t give it fast enough. Over the years it was one of my greatest joys to give people that experience for themselves. It was a thrill to meet Snooty. He liked you, and was unhesitating about showing it. Raised from infancy by humans who’d loved and fussed over him and called him “Baby,” he’d grown to love people right back. special. As he gummed my hand or elbow, taking progressively more of my limb past his bristly face and into his toothless, chomping mouth, I knew my abraded skin would sting for hours. And I absolutely did not care. I never wanted it to end. and fussed over him while he gummed and nuzzled me, and in time I was me again. Because of very special circumstances, Snooty was an animal who related to the people he knew and constantly expanded his orbit to include new ones. I never fed him, but that wasn’t required. He interacted with me and behaved like he genuinely enjoyed our time. And there I pause, because I believe the magic of Snooty was that he seemed to enjoy most of his time. Swimming down deep in his tank, he did barrel rolls. Eating breakfast from the hands of a volunteer, he’d pause to do a trick, completely unprompted. He thrilled us, watching him, because whatever he was doing, it looked like he was unabashedly enjoying it. So children, less constrained than we grown-ups, would loose themselves and start shouting, cheering, uninhibited in their glee. They loved Snooty. We loved Snooty. In him we could feel our own surging joy. Death is sad, but this is a very very sad death. My husband Byron grew up with Snooty and he wanted to do this awhile ago, but since Snooty passed he thought it would be a nice way to remember him. We visited Snooty in 2016 and fell in love with him! We are really upset to hear that he died. We know how much the staff will miss him and hope they are ok.
Snooty was my favorite manatee in the whole wide world. I wish his death in the At The Bishop did not happened. I wish he was still alive. I LOVE you SNOOTY. Rest in peace. Very few counties in Florida have a personality, a legend larger than life, an animal that has endeared itself to so many people, and oh what a face, how can you not love it, Snooty, just the name says it all, a whiskered-snout surrounding a whiskered-smile. An encounter with Snooty was an event one could never forget, especially as a young child. I recall visiting Snooty at the museum when it was at the Memorial Pier. Snooty was a child himself, and brought a smile to this young boy as I watched him swim in the small tank. Even as an adult it was a thrill to visit Snooty. As a photographer for the Bradenton Herald there were many occasions for me to stop by, photograph and visit with Snooty. Sometimes he would just float in his own little peaceful water world, and at other times come out of the water, grasp the side of the tank and look at you, and once he reached out and touch my leg with his wet flipper as I took his picture. Snooty not only was a mascot for Manatee County, but he was a teacher, a living science lesson to many a generation of school children, offering a chance to observe, know, and establish a relationship, if only a small way, with an animal like no other, a species close to extinction. The passing of anyone dear offers a time of reflection both backward and forward. Manatee County will never be the same without Snooty, but we also are a better place because of Snooty. Snooty became the companion to many manatees at the Parker Aquarium as they were rehabilitated to return to the wild. To carry on this mission is a legacy he leaves behind, and one Manatee County should embrace. 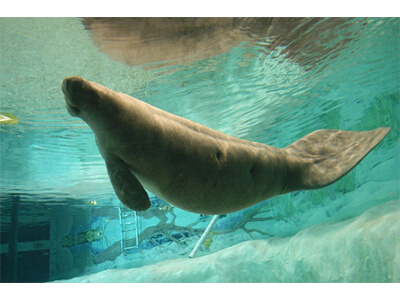 Snooty will be missed in Manatee County and by the many visitors that passed through our Friendly City over the years. We will never forget our loved Snooty the Manatee. Thoughts and prayers go out to everyone at the South Florida Museum. When my granddaughter Addie moved with her family to Bradenton, the museum and Snooty was our very first stop. Addie has loved Snooty and she and I always made a special trip to see him when I was in town. Snooty brought Addie and so many others joy and happiness. Rest in peace, dear Snooty! We have only known Snooty for a little over a year – when we moved to the Bradenton area. He was a magnificent animal, a wonderful ambassador for manatees and, most of all, he was a funny old curmudgeon who had all his humans well trained. I am very glad we saw him as often as we did. I am happy he got to enjoy his birthday cake and we will miss him very much. Goodbye dear Snooty. Snooty was no beauty, but we loved him all the same. Amazing how a manatee could put us all to shame. To make our visits happy times, full of affability. Were qualities that gave him grace. Was always nosing for veggies and fruit. We’ll think of you with a tear in our smile. I grew up seeing Snooty. We enjoyed many of his birthday parties. We will miss you Snooty! Born and raised here in Bradenton, I grew up going to see Snooty the manatee. My grandma would take me to see him and school would take me as well. Snooty was always fun to go see. It was my dream to grow up and work for the museum and sadly I never have. In 2010 we had our senior prom at the At The Bishop out in the courtyard. We would go up to the glass and watch Snooty swimming around his tank and he would come and watch us as well. I have a picture of him from that night, but it’s not a great one. It was such a fun night because instead of dancing, which I wasn’t much of a fan of anyway, I hung out over by the tank most of the night with some friends and we all just watched Snooty swim around. My five year old got to meet Snooty on June 19, 2017. His gram took him and I know he enjoyed himself. I’m so thankful he got to meet him, but now he’s saddened by the death as well. To this day I still regret not going to see Snooty on his 69th birthday because it was raining and I’d have had to take both my five year old and two month old for a walk in the rain just to get there so we didn’t go and I regret it. Snooty had the kindest soul. It’s still shocking he’s gone. I had just left church and was checking Facebook when I saw the news. It was a punch in the face and I nearly started bawling. I’m writing a poem about him, I might share it with the At The Bishop eventually. It’s amazing how much of an impact he had on this community. He was a staple in our community. He was a legend. Rest easy, baby Snoots. You will be deeply missed. Snooty was incredible. My husband visited Snooty as a child and for the past five years, our son was able to visit Snooty often. It was magical getting to share that same experience and wonder of an amazing creature. Thanks for all the memories. I have a 16 year old son with autism and he absolutely adored Snooty. He accidentally came across the Snootycam online about a year ago, and had watched it ever since. We live in California and never got to meet Snooty in person, but definitely felt like we knew him. Through the Snootycam, Snooty brought joy and comfort to my son, and for that I will forever be grateful. In life, Snooty unexpectedly touched our lives in a beautiful way; his memory will continue to do so even after his death. I first saw Snooty in June 2013 before I even moved to Florida. In September the same year, I applied for a volunteer position at the aquarium and got to meet Snooty in person. After the meet and greet and my interview I was told it would be okay for me to leave for the day – my response: Can I stay? And I stayed with Snooty until the museum closed that day. Volunteering with Snooty was an honor. I’ll always remember with a smile how on certain days he wanted his romaine leaf by leaf. On other days he preferred the cores first, then the outer leaves. A week later, he’d only take the romaine cut into perfect quarters. The news of Snooty’s passing felt like the passing of my best friend. Snooty projected such a loving friendship that I’ve hardly ever experienced in a person. He inspired me to dedicate my life to work in manatee conservation as a staff member of Save the Manatee Club. Although Snooty is munching on his favorite treats in manatee heaven right now, I’ll continue my work to help his wild manatee friends out there – with him watching from above. My sympathy to all of Snooty’s caregivers, who did everything possible to give Snooty a good life. I am heartbroken that he’s no longer with us. Our grandchildren loved to see him. The Thursday after Snooty’s passing, I went to the Safety harbor pier. fortune was on my side for there were 2 calves and 2 moms. I said a blessing for all, especially for the calves in memory of Snooty: may all grow old and wise, may the curious nature and a sense of humor be life-long and may all stay out of trouble and harm’s way. I cannot imagine how difficult it must be for all who were fortunate enough to have worked with and around Snooty for all of these years. The ache in my own heart is so great, as Snooty was part of my daily routine in CA! The very first thing I do when I arrive at work is turn on the Snooty Cam and observe the amazing Snooty and his pals. I will miss him greatly, and regret that I never had the chance to meet him in ‘person’! It is rare for a single animal to have such a world-wide impact and to become so incredibly beloved by all! Best wishes to everyone at the South Florida Museum. I hope your fond memories of Snooty will help you get through these dark days. for us to take of its joy. (taken from a poem by Flavia Weedn). You have left footprints on so many hearts, Snooty! We all miss you so very much! Sending our loving thoughts to the staff, board, volunteers and donors of South Florida Museum. What a beautiful life you gave to Snooty. The entire Save the Manatee Club were saddened to hear about the death of Snooty, the world’s oldest manatee in captivity, and offer our sympathies to the staff and friends of the At The Bishop and appreciation for what Snooty meant to the cause of manatee awareness. It’s probably safe to say that no community in America has been more deeply attached to a single animal than Bradenton was to Snooty. He was the face of the city and the mascot for the county. But more than that, to people who lived here, he was a friend. At Around the Bend Nature Tours we grieve alongside the staff of the South Florida Museum. visitors of all ages developed a deeper understanding of environmental issues after a visit to the Parker Manatee Aquarium. Snooty was an ambassador for manatees and all of Florida’s wildlife. Sending courage and peace. I loved Snooty. I’ll really miss him. But he changed something in me, and I will carry that on. Long years ago as a preteen in north central Florida, I saw a public service announcement by Jimmy Buffett. It stuck with me because it came from the artist who sang “Cheeseburger in Paradise,” but its manatee conservation message was largely lost. It would be a long time before marine animal protection resonated deeply with me. Yet that did happen, and I owe the transformation to Snooty. Magnificent, gentle, and absolutely filled with personality: I came to care about him deeply. So this morning, walking on the beach, I reflexively leaned down and picked up a piece of plastic. By the time my walk was done, I had a small cupful of plastic, each item landfill-bound. Dropping it safely into a garbage can, I whispered something nice to Snooty. When I first saw the headlines that Snooty had died, my heart sunk. I have been deeply saddened every day since then. Snooty was part of me, a native of Bradenton. I have never known life without him here in my hometown. I cannot imagine the grief of Snooty’s keepers. Know that I grieve with you and carry Snooty and all that he stood for in my heart. My mom and I visited Snooty every year for the past 7 or 8 years. We tried to visit around his birthday most years and I took countless photos of him, squishing his face across the aquarium and smiling. We made a day out of our time with snooty. It was quite an experience to see him eat and relate to his keepers. My heart broke when I heard the news. It will be so odd to com to Tampa and not have Snooty on my list of visits but when I’m ready, I’ll come back and give some love to the other manatees. So many wonderful field trips as a child and then able to share my love of Snooty with my children and grandchildren. Most memorable was Snooty birthday when my daughter Jacqui was only 3 years old. We lived near there and my girls had their prettiest party dresses on. Snooty was still in his old tank and people were still able to feed him. Children were crowded around the tank bustling for a look. A very kind gentleman was lifting the smaller ones up so they could see Snooty enjoying his birthday treats. He came up behind “little Jacqui” as she was known in a family with three “Jackies” and lifted her up for her turn. When she was finally high enough for her first look at the birthday boy, her excitement turned to terror as she thought the man was going to throw her in with him. She wrapped both arms and both legs around his head like an alien, screaming hysterically. The poor guy never knew what hit him! After we peeled her off his head and she calmed down one of the handlers offered her a chance to feed him, she quickly overcame her fear and wished him a very happy birthday. A very sweet, funny special memory of our Snooty, he will be missed. Rest in peace Snooty, you brought joy to millions. I loved to tell people about you and see people fall in love with your spirit. I’m happy I got to meet you! The world lost one of its most amazing creatures. You are forever in the hearts of all Americans. I’ve been here in Manatee county since 1979 and attended several Hernando DeSoto parades with the after parties where Snooty called his home. He was one of a kind and had a very unique personality. It’s very heartbreaking. We learned so much from him through the years so thank you Snooty you will always be in our hearts. My daughters, my grandson and a couple of close friends went to visit Snooty a few months back here are a few pictures. So honored to have been able to see Snooty a couple of times and to be there for his last birthday party. He was so happy, he was almost glowing. I pray the staff of the museum finds comfort in the wonderful life they gave this precious creature and in knowing that he lives in every day and the hearts of all those he touched. I was born and raised in Sarasota in the 1960’s/70’s. The first time I saw Snooty was on an elementary school field trip. He was such a gentle giant and after seeing him, I was totally hooked on manatees. I left Florida after graduating high school in 1979. After moving to the Washington, D.C. area, I met my future husband Ron. When we first visited my hometown in 1981, I took him to see Snooty. Ron couldn’t help but being charmed by my old friend. Although I didn’t see Snooty on every yearly visit “back home”, it was somehow comforting to know he was there. He was a perfect mascot for Bradenton and helped raise awareness for these wonderful animals. It’s taken me a week to compose this letter, as I have been quite upset from the sad news of Snooty’s passing. While his death was a very unfortunate tragedy, getting angry will not bring him back. We can only hope that this accident will help ensure the safety of the other manatees kept in captivity. Growing up in Bradenton, I don’t know my life without Snooty. He was a sweet, gentle animal. When I worked at the museum in college, I made sure to say hi to snooty everyday. Snooty, you will be greatly missed! Although I never had the privilege of meeting Snooty, I still feel a deep connection to him formed through hours spend observing him via the Snooty Cam. I wish more than anything that I could have made the journey to visit him while he was still alive, and that the positive impact he had for his entire species continues as his legacy lives on. As original girls from Manatee County (Bradenton), we will always remember and save a special place in our heart for Snooty!! My little girl Ciera loves you forever!! No news has ever made my heart as heavy and as sad as the day I learned of Snooty’s tragic passing. Oh how I cried and mourned for that super special Manatee. Snooty, so full of life and love for humans. Such a happy, expressive, beautiful face. To meet Snooty was to change your life forever, he brought out the best in us humans; he brought us countless smiles, he gave us unconditional love, he taught us so much about his species, he loved his tank mates, he never complained. Animals are the ones who truly teach us humans what true, pure love really is…. and Snooty was the ambassador in that department! He was certainly a special creature of God, sent to us for a reason… one need only read all of the memorial comments to realize how many lives he touched, how many hearts he healed, how much he meant to all who crossed his special path on this earth. Snooty’s caretakers, the museum, the community of Bradenton, Florida, and other Snooty lovers world-wide have a hole the size of a Manatee in their hearts. I will never forget my first and last encounter with Snooty, nor the visits in-between, each interaction deeply touch my soul. Thank Snooty for all you gave to us, all that you taught us. I bid you farewell dear Snooty — our beloved friend… until we meet again. Former Snooty birthday party day volunteer from Save the Manatee Club, FL. Manatees have always mesmerized me. It wasn’t until I stumbled across the Snooty Cam that I discovered Snooty, and it came at a time I needed it most. Watching Snooty became a therapy in a way. I was unhappy at my job, location, and just by logging in to see him twirling through the water brightened my toughest days. I finally got to meet Snooty this past January and it was a dream come true. You could look around the room and see the joy he brought to so many. My thoughts and prayers are with the caregivers, friends, and community. He will forever be missed. Gone but never forgotten. In honor of Snooty! You were loved! I will miss you. I have followed Snooty for sometime on the computer, but I was not able to visit Snooty till this past April while on vacation at Anna Maria Island. Snooty touched my heart. I felt joy seeing him and knowing how much his sparkling personality had delighted people of all ages. I returned to see him at his 69th Birthday Bash. To see all the children of all ages sing “Happy Birthday” to him twice caused me to well up with tears. THANK YOU SNOOTY FOR SHARING YOUR LIFE AND JOY WITH US ALL OF US. I first saw Snooty in June of 2000, roughly a month after my mom died that year. I noticed that Snooty was born almost exactly 7 years after my mom ( he was born a day too early!). I’ve been following him -and his occasional tank mates- since then, visiting when able. I will miss his sweet side and his smart side and the sense of humor seen when it came to feeding time. Thank you, Snooty for being a part of my life. Having first met Snooty when I was a naïve teenager in the 1960’s, I was overcome with a mixture of excitement, wonder and compassion and hope. Excitement to be the center of his attention. Wonderstruck at being greeted by him so up close and personal, but then feeling compassion for his situation as a lone manatee in a chlorine scented sterile environment. Despite my mixed emotions, I left hopeful that he and all wild manatees could have a better life. Although I am profoundly saddened by Snooty’s premature passing, I am grateful that Snooty’s personal environment was later vastly improved with both his new surroundings and the opportunity to mentor young manatees destined for a hopeful return to the wild. I am heartened by the knowledge that Snooty will live on in the memories of so very many people who grew to love and care for him during his 69 years. Finally, I look forward to our continuing the work to make Florida and all of the world’s manatee habitats a safer place for all manatees. Bless all those who cared for and loved Snooty, a truly unique manatee. My husband Patrick and I met at the South Florida Museum. We were both there to meet a manatee named Snooty, and luckily, we also met each other. A year later, Patrick proposed to me privately in the newly built boardroom, in front of the manatee that introduced us. After accepting his marriage proposal, we had an amazing surprise engagement party, and Snooty was the perfect host. He was there when we met, and was there to witness the beginning of our life together. Snooty’s passing is deeply devastating for us, for he has always been a huge part of “our story.” Something we will always hold dear. Our Condolences. Snooty, thank you for introducing my children to ocean animals. You have taught them to love marine life, especially manatees! They loved to come see you and interact with the touch tank every visit. Our hearts are broken with your loss. It is going to be very hard to get them to come visit now that you are gone. With time their hearts will heal and you will always be in our memories! Thank you for being the initial manatee to help all other manatees, for being in captivity for so long so people could learn from you, to watch out for your kind when boating, to being able to take better care of your kind in our waters, we learned how to admire your species and better understand how your kind is and always so gentle, an animal worth caring for! Thank you for your lifetime of service Snooty, you will be missed. We were deeply saddened by Snooty’s loss and wanted to do something to remember him by. We made a little memorial for our outside garden so we will remember him every time we see it. We will always ❤️ Snooty! Snooty’s Gala and Nathanael’s birthday sleepover will always be special memories for our family.